Knowledge of the complete horizontal migration and vertical movements of Atlantic salmon (Salmo salar L.) during the marine phase is important for understanding the link between individual processes and population recruitment. We studied the detailed migration behaviour of six post-spawned adult Atlantic salmon from a North Norwegian river, during the entire ocean migration, by using high-resolution light-based geolocation archival tags. The fish performed long-distance migrations and utilized Arctic areas from the eastern Barents Sea, to areas of Jan Mayen Island, and north to Svalbard. Four of six individuals exhibited a strong fidelity towards Jan Mayen Island, particularly during winter, which may suggest that the ecological conditions in these waters may be important for overwintering. One fish displayed exclusive utilization of the Barents Sea, indicating that growth and survival of some individuals are entirely dependent on these waters. The fish displayed a pelagic behaviour and all individuals spent more than 83% of the time in the uppermost 10 m of the water column. There was a strong seasonal trend in diving intensity, with the number of dives increasing with day length, independent of individuals’ spatial distribution. Diving depth was positively correlated with the depth of the mixed layer. The Atlantic salmon displayed large individual variation in horizontal migrations, utilizing different ocean areas north of the Arctic Circle. This means that, despite the overall fidelity towards northern latitudes, individuals from the same population may experience highly different ecological conditions, potentially contributing to within-population variation in growth and survival. The seasonal correlation between diving intensity and day length, and spatial correlation between diving depth and depth of the mixed layer, indicate that the overall depth use of the Atlantic salmon depends on both spatially independent seasonal factors, and dynamic oceanographic conditions that facilitate food aggregations. This is the first study of Atlantic salmon to present detailed information about individuals’ continuous horizontal migration and simultaneous vertical movements during the entire ocean migration, thus providing novel information on how habitat use change throughout the ocean residency. Atlantic salmon (Salmo salar L.) is an anadromous species distributed across the North Atlantic Ocean, with both juveniles and post-spawned adults undertaking long-distance ocean feeding migrations . Throughout their distribution range, many Atlantic salmon populations have experienced substantial declines [2, 3]. These declines are partly caused by reduced marine growth and survival [2, 3], making knowledge about the ocean migration pivotal for understanding the long-term declines in population abundance. During the past few decades, advances in animal biotelemetry have promoted new insights into the behaviour of aquatic organisms by enabling researchers to track the movement of free-ranging individuals using a variety of electronic tags . This development has provided novel information for a variety of species, in addition to disentangling important concepts in behavioural ecology [e.g. 5, 6]. For Atlantic salmon, a challenge has been to track the continuous horizontal migration of individuals in the open ocean. In recent years, pop-up satellite archival tags (PSATs) have been used to map ocean habitat use [7–9]. However, as PSATs eventually detach from the tagged fish and transmit archived data to passing satellites, detailed descriptions of the entire horizontal migration are difficult to obtain. Studies using archival tags, which require recapture of the fish to retrieve the data, have succeeded in describing the depth use of individuals during the entire ocean migration [10, 11]; however, they have not been able to provide detailed descriptions of individual migrations [12, 13]. Therefore, information on the continuous horizontal migration of individual Atlantic salmon during the entire ocean residency is lacking. In studies of long-distance fish migrations, inference of fine-scale behaviour is often limited to the vertical dimension, because data on horizontal movements are commonly confined to a daily resolution for methodological reasons [e.g. 14]. For fishes, depth use is controlled by multiple ecological and physiological functions [15, 16]. For pelagic species performing long-distant oceanic feeding migrations, vertical movements are often interpreted as searching and foraging behaviour with shifts in depth use often associated with alternation between these behavioural modes  or changes in prey fields [5, 18]. Long-term investigations of depth use will therefore provide valuable information about the behavioural ecology of migratory fishes, particularly when combined with information on horizontal distributions [e.g. 18, 19]. 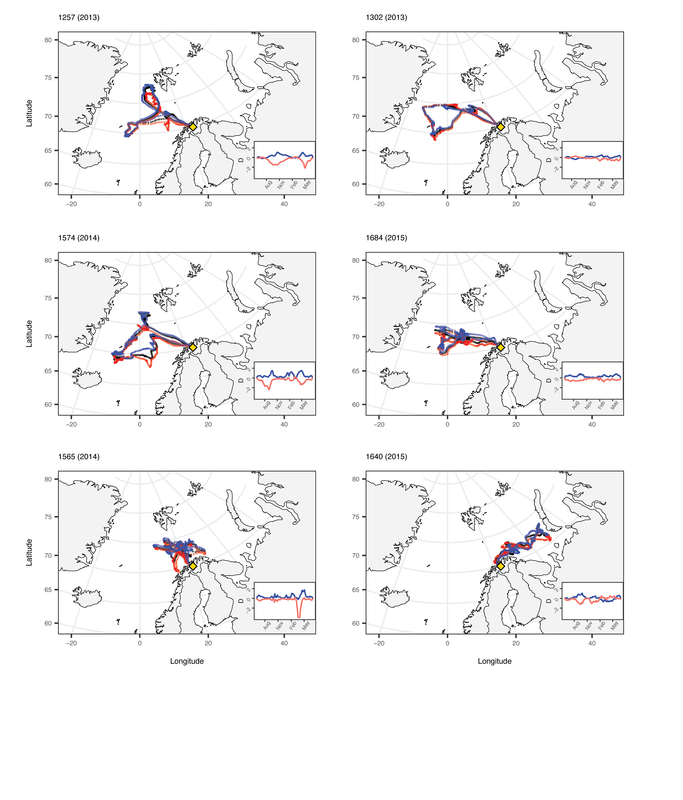 Recent studies of Norwegian and North American Atlantic salmon tagged with electronic tags have revealed migrations towards sub-Arctic and Arctic waters, accompanied by an overall pelagic behaviour with occasional dives to depths exceeding 500 m [7, 8, 11, 12]. However, substantial variation in migratory behaviour exists both within and between populations [7, 8]. In a recent study of a North American population, individuals displayed diverse horizontal migrations, changing their vertical movement patterns when occupying habitats with contrasting oceanographic conditions . In comparison, for Norwegian Atlantic salmon inhabiting Arctic latitudes, depth use correlated with seasonal changes in light, with individuals spending more time near the surface during the winter polar night . These studies have substantially increased our knowledge about the migratory behaviour of Atlantic salmon, but detailed information about the interplay between the continuous horizontal migration and vertical movement for the full migration cycle is still missing. Simultaneous descriptions of the horizontal migration and vertical movements will therefore enable a greater understanding of the movement ecology of Atlantic at sea by disentangling how abiotic and biotic factors impact individual behaviour. The aim of the study was to investigate and map the continuous horizontal migration and investigate the vertical behaviour of adult Atlantic salmon from a North Norwegian river during the entire ocean migration. This was done by tagging post-spawned Atlantic salmon, before they left the river in the spring, with high-resolution light-based geolocation archival tags that recorded temperature, depth, and light intensity at 30-s intervals. Geolocation estimates obtained from the light data, in combination with depth and temperature measurements, were incorporated into a hidden Markov model (HMM) to geolocate the fish during the entire ocean residency. Tags were retrieved from fishers and anglers, who recaptured the tagged individuals when the fish returned from their ocean migration after spending approximately 1 year at sea. The capture and tagging of fish were performed in the Alta River, Northern Norway, in 2013–2015 shortly after ice break in May. The Alta River is located north of the Arctic Circle (Fig. 1, 70°N 23.4°E), has a drainage area of 74,000 km2 and a 46 km stretch accessible for Atlantic salmon. Since 2000, the annual catches in the river have ranged between 11.2 and 28.7 t . Repeat spawning is common within the population, with most post-spawned individuals entering the ocean during spring and return to the river after spending approximately 1 year at sea . In total, 197 post-spawned adult Atlantic salmon (kelts) was tagged with Lat-2810 archival tags (Lotek Wireless Inc., Canada). The tags comprise a tag body (13 mm × 44 mm) and an antenna (175 mm long) and have a total weight of 12.8 g in air. Fish were captured by angling with barbless treble hooks and anaesthetized in aqueous solution of 0.5 ml l−1 2-phenoxy ethanol prior tagging. Only fish in good condition with no visible trauma from the angling procedure were tagged. Females were prioritized for tagging (n = 196) because they tend to have higher survival rates until repeat spawning than males . Mean body weight of the tagged fish was 7.0 kg (range 3.5–13.8 kg, SD 1.9 kg), and the average total length was 97 cm (range 82–121 cm, SD 8 cm). Tags were inserted into the fish body cavity through a 20-mm-long lateral incision. After insertion, the body wall of the fish was pierced using a trocar, allowing the antenna to exit and lie laterally along the fish’s body. The surgical incision was closed using a 3.0 Ethicon suture. The light sensor antenna was externally attached with a suture approximately 10 cm from the surgical incision above the pelvic fin, pointing backwards, to decrease drag and to prevent movements of the antenna that might cause mechanical damage. The tags require retrieval to access the logged data. Recapture of tagged fish relied on anglers in the Alta River and net fishers in the Alta fjord and adjacent waters. For facilitating tag retrieval, the fish were also tagged with a small individually numbered Carlin tag below the dorsal fin and a 1000 NOK (~ 130 USD) reward was announced for recaptured tags. The tags were programmed to record and archive internal and ambient temperature, pressure, and light intensity at 30-s intervals. The time-series data were available upon tag retrieval, along with daily summaries of the archived data. The summary file included daily geolocation estimates based on the light data, and daily estimates of sunrise, sunset, and local noon. The on-board geolocation in the LAT-2810 tags provides estimates of latitude and longitude based on both a threshold method and a template fitting method . All light-based geolocation methods require light curves with enough diel variation in light intensity to provide estimates of latitude and longitude. This causes problems with positioning in polar areas where such light curves are difficult to obtain for large parts of the year as the sun is either above or below the horizon for extensive periods. Light-based geolocation is initiated by deriving the time of sunrise and sunset, followed by estimating latitudes as a function of day lengths and longitudes based on local noon or local midnight . As latitudes are derived from the length of the day, a mismatch between the true sunrise and sunset and the estimated sunrise and sunset will cause an inaccurate latitude estimate, whereas for the longitude this will not impact the estimate given that the error is symmetrical for both events. In addition, inaccurate proxies of either sunrise or sunset will provide larger deviation from the true position for latitudes than longitudes, as potential measurement errors of both sunrise and sunset will be incorporated directly into the estimate. These factors, in combination with latitude estimates being unobtainable for the period around the equinoxes, make estimating latitudes particularly problematic in regions with highly seasonal light regimes. To measure the empirical error associated with estimated latitudes and longitudes for the threshold and template fitting methods, and to determine which of them was the best-suited method for our data, two tags were positioned at a known location (69.890°N, 18.571°E) for approximately 12 months. Based on analysis of data from these tags, we opted for the threshold method for the tagged fish as this approach provided reliable longitude estimates for the longest time period, although both methods providing inaccurate latitude estimates with substantial biases that varied throughout the year (Additional file 1: Figure S1). When using this method, sunrise and sunset are defined as the time of the day when the rate of change in light intensity exceeds a certain threshold . In theory, longitude values are therefore obtainable during large parts of the polar night if the measurable light intensities exceed the predefined threshold, and the error associated with this rate of change is symmetrical for both sunrise and sunset. For the recovered tags, only a subset of the longitude estimates and none of the latitude estimates were retained. The filtering of longitude estimates was done manually by removing days with insufficient light curves during the polar day, the absence of light during the polar night, and days when the sunrise and sunset estimates did not correspond to the raw light data (Additional file 2: Figure S2). The proportion of retained longitude estimates varied from 29 to 45% for the individual tags (Table 1). The horizontal distribution of the tagged fish was reconstructed using a discrete-time hidden Markov model (HMM) . HMMs are a class of state–space models that generate daily non-parametric positional distributions (i.e. posterior distributions) on a discrete grid . The posterior distributions in the HMMs are generated by a two-step forward filter, and a backward smoothing step that ensures serial dependency in the Markov chain . The forward filter consists of two stochastic models: the process model, which represents the underlying movement scheme (i.e. convolution scheme); and the observational model that updates these probabilities depending on the likelihood of the data recorded by the tags. The process model used was identical to the one applied in Strøm et al. . This convolution scheme assumes movements according to a diffusion process and creates Gaussian-like movements between consecutive days by solving the diffusion equation using the finite difference method multiple times for each time step, on a 10-km equidistant grid . Daily data likelihoods were constructed using the daily mean of ambient water temperatures at the surface (> 1 m), the daily maximum depth, and the filtered longitude estimate (Additional file 3: Figure S3). For temperatures, the daily likelihood on each grid position was modelled as a Gaussian random variable, with mean and standard deviation derived from the operational sea surface temperature and sea ice analysis (OSTIA) database , which correspond to temperatures at depths ≤ 1 m . For the depth filter, grid positions with depths exceeding the maximum depth recording for that given day were set to one, with all other positions set to zero. The reference bathymetry grid used was the GEBCO_2014 30 arc seconds grid . Filtered longitude estimates were modelled as independent lognormal random variables, because the estimated error of the moored tags was better approximated using a lognormal than a Gaussian distribution. The scale and location parameters were approximated to 1.03 and − 0.69 by maximum likelihood estimation. Individual migration routes were estimated as the mean of 1000 random tracks, sampled through a backward sweep of the daily posterior distributions . Individual spatial distributions were quantified for the first summer (time of ocean entry—August 6), autumn (August 7–November 6), winter (November 7–February 2), spring (February 3–May 4), and second summer (May 5–recapture date), by calculating the residency distributions (RD) for each season. RDs are the cumulative probability distribution across the spatial domain, thus providing an estimate of the spatial distribution including the uncertainty of the data . Seasons were defined based on the annual solstice and equinoxes by dividing the time series depending on the cross-quarter moments (i.e. days with equal length to solstice and equinox). This corresponds with the seasonal variation in light regimes in the geographical areas that Atlantic salmon from the Alta River is known to inhabit . The model’s sensitivity was assessed by running reconstruction with omission of the recapture positions and with altered start and end coordinates. In addition, to investigate the potential effects of tag inaccuracy on model performance, all tracks were reconstructed with daily mean temperatures increased and decreased by 0.3 °C, reflecting a conservative measurement of the 0.2 °C temperature error reported by Lotek. The seasonal effect on diving intensity was analysed using generalized linear mixed-effect models (GLMMs), with the number of dives per week as the response variable, weekly day lengths as the predictor variable, individual fish as the random effect, and a negative binomial error structure correcting for overdispersion (Table 2). Dives were defined as descents from the surface (depth < 5 m) to depths exceeding 10 m, terminating when the fish re-entered surface waters. Weekly day lengths were considered a suitable proxy for seasonal changes and determined by calculating the theoretical day length of the weekly mean position obtained from the mean tracks using the “suncalc”-function in the R-package “RAtmosphere” . Seasonal changes in diel diving behaviour were investigated by calculating the mean of the absolute vertical displacement spent in hourly bins for each day at liberty. The relationship between depth of the mixed layer and diving depth was investigated using linear mixed-effect models (LMM), with weekly mean diving depth as the response variable, weekly depth of the mixed layer as the predictor variable, and individual fish as the random effect (Table 2). Both variables were log-transformed in order to prevent violation of model assumptions. The weekly mean diving depth was defined as the mean of daily mixed-layer depths at the mean track positions derived from the operational TOPAZ4 Arctic Ocean systems . The relative fit of the GLMMs and LMMs was evaluated using the Akaike information criteria (AIC). The significant effect of the predictor variable in the final models was assessed by comparing them against their respective null models, which only included the random effect of individual fish, using the analysis of deviance test. Of the 197 tagged Atlantic salmon, 10 were recaptured in the Alta River or adjacent waters on their return migration, whereas 9 were recaptured shortly after tagging and consequently omitted from the analysis due to the short period of data collection. The tags had a high failure rate, and of the fish recaptured on their return migration, data were only retrieved from six tags, with the remaining four tags malfunctioning due to technical failures. These six fish exited the river between May 24 and June 15, spent between 375 and 414 days at sea, and had a maximum displacement from the river according to the mean track of 709–1308 km (Table 1). 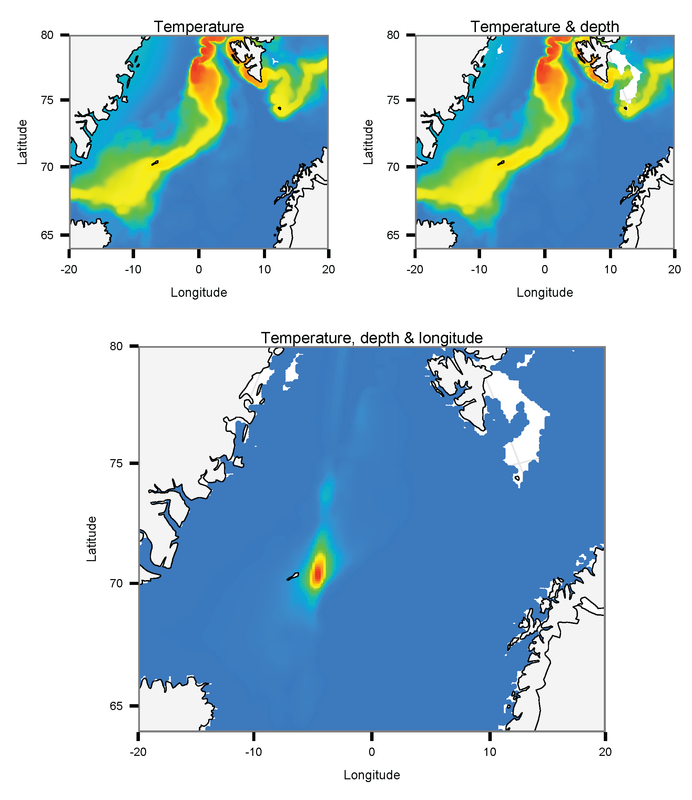 The mean track and seasonal residency distributions (RDs) of the six Atlantic salmon revealed an overall utilization of waters spanning from the eastern Barents Sea, to the Greenland Sea, with the northernmost-oriented individuals migrating towards areas of the coast of the Svalbard archipelago (Figs. 2, 3, 4, and Additional file 4: Figure S4). 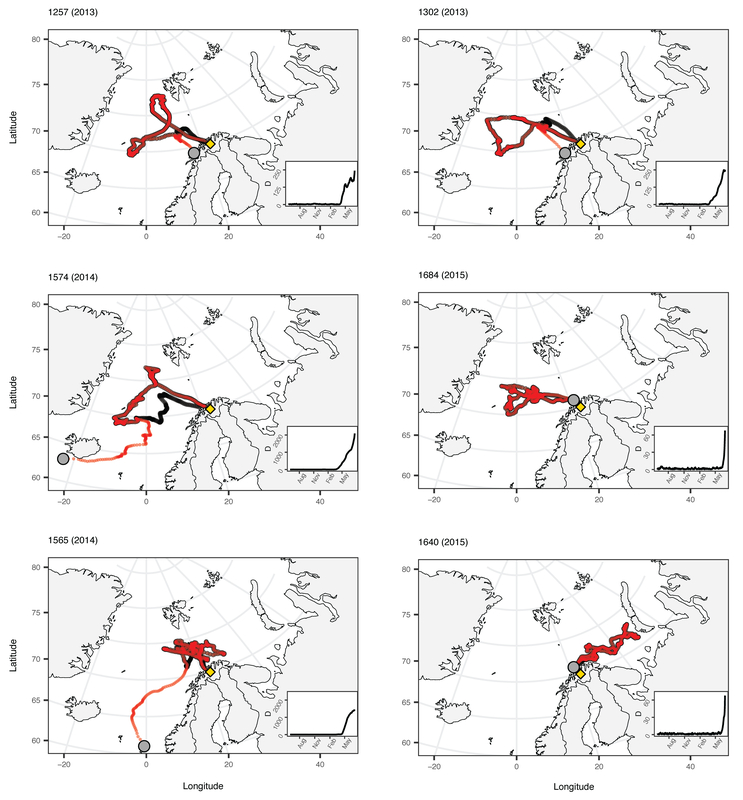 The tracks and seasonal RDs for four fish revealed a northwest migration towards various latitudes north in the Norwegian Sea during the first summer and autumn, before residency near Jan Mayen Island in late autumn and winter (ID = 1257, 1302, 1574, and 1684) (Figs. 2, 3, and Additional file 4: Figure S4). The mean tracks for these fish indicated a general tendency of inhabiting higher latitudes during the first summer and autumn in comparison with the winter and spring period, with a partial counterclockwise migration evident for three individuals (ID = 1257, 1302, and 1574) (Figs. 2, 3). For the remaining two Atlantic salmon, mean tracks and seasonal RDs provided evidence of at least partial utilization of the Barents Sea (ID = 1565 and 1640) (Figs. 2, 4, and Additional file 4: Figure S4). One of these fish depicted a clear eastward migration with a strong fidelity towards waters near Novaya Zemlya during autumn and winter (ID = 1640), whereas the other primarily resided near Bear Island (ID = 1565) (Figs. 2, 4). When comparing the tracks lacking a fixed end point to the tracks including the known end location, no differences were detected until late spring (Additional file 5: Figure S5). Tags deployed in 2013 depicted a slight divergence during the second summer when omitting the end points, with tracks terminating further south along the coast (ID = 1257 and 1302) (Additional file 5: Figure S5). For the two tags deployed in 2014, substantial alterations were detected during the final stage of migration (ID = 1565 and 1574) (Additional file 5: Figure S5). The two tags deployed in 2015 mirrored the original reconstructions for the entire period (ID = 1640 and 1684) (Additional file 5: Figure S5). For reconstructions with changed start and end locations, differences in model results were only present during the initial and final phase of the migration (Additional file 6: Figure S6). When altering the daily mean temperatures, minor divergences from the original tracks were detected for all reconstructions at various stages of the migrations (Additional file 7: Figure S7). Minor northward displacements occurred with decreased temperatures, whereas when temperatures were increased, positional estimates were marginally south of the original tracks (Additional file 7: Figure S7). The Atlantic salmon displayed a pelagic behaviour with all fish spending more than 83% of their time close to the surface (depths < 10 m). Maximum diving depths ranged from 324 to 740 m (Table 1). Overall, there was a strong temporal trend in the depth use, and the proportion of time spent in surface waters depicted a seasonally cyclic pattern (Fig. 5). All fish displayed a strong surface orientation both shortly after ocean entry and during winter and early spring, with a greater use of deeper parts of the water column during the period extending from late summer to autumn and during the final months of the migration (Fig. 5). A similar trend was also evident in the analysis of diving intensity, which revealed a significant correlation between day length and diving behaviour (analysis of deviance test: χ2 = 228.3, p < 0.001), with the number of dives per week increasing with the length of the day (Fig. 6). The generalized lineal mixed-effect model (GLMM) that provided the best fit to the data included a random effect of individual fish on both the model’s intercept and slope, indicating that some of the observed variation in diving intensity was explained by individual behavioural differences (Table 2). All fish displayed diel variation in vertical movement patterns during the autumn and spring, with individuals performing longer vertical movements during daylight hours than at night (Fig. 7). Overall, the most profound diel variation was present during the autumn (Fig. 7). In contrast, no clear diel variation was present during the summer periods, whereas in winter, substantial diel variation was only present for one individual (ID = 1684) (Fig. 7). No consistent seasonal pattern in diving depth was recorded, with fish diving to relatively deeper depths either during winter or spring (Fig. 8). The diving depth of individuals was significantly correlated with the depth of the mixed layer (analysis of deviance test: χ2 = 99.4, p < 0.001), with individuals diving to greater depths as the mixed layer deepened during winter or spring (Fig. 8). The linear mixed-effect models (LMM) that provided the best fit to the data included a random effect of individual fish on both the model’s intercept and slope (Table 2). Previous electronic tagging studies on the horizontal migration of Atlantic salmon have either been limited by only describing the first part of the ocean migration [7, 8] or by describing coarse spatial distributions [12, 13]. The current study is therefore the first to provide detailed information about the continuous horizontal migration of individual Atlantic salmon throughout the entire ocean residency, providing indispensable information about the habitat occupancy for the winter and spring period. Individuals in this study utilized different ocean regions during the ocean migration, similar to North American Atlantic salmon , strengthening the evidence that diversification of migration routes is common for Atlantic salmon of the same life stage and population. The utilization of waters from the Barents Sea in the east, to the Svalbard archipelago in the north, and Jan Mayen Island in the west, suggests that while individuals use partially distinct oceanographic regions, the entire population may use extensive parts of the northeast Atlantic Ocean. Despite the individual differences in horizontal distribution, this study revealed an overall strong fidelity towards the northern Norwegian Sea, with four of the Atlantic salmon utilizing these waters during extensive periods. These distributions overlap with the occurrence of maiden Atlantic salmon in recent fishery independent surveys, modelled habitat occupancy for post-smolts from various European Rivers, and the end positions for pop-up satellite archival tags (PSATs) that detached from post-spawned Atlantic salmon [11, 31, 32]. This suggests an overall utilization of these waters for various populations and life stages. Furthermore, the current observation of utilization of waters in proximity to the Svalbard archipelago strengthens the evidence obtained from a genetic study that revealed a greater presence in Arctic areas for the northernmost Atlantic salmon populations than for their more southern counterparts . This study provided evidence that waters in proximity to Jan Mayen Island might be important overwintering areas for post-spawned Atlantic salmon from the Alta River. Previous studies on the overwintering habitat of European Atlantic salmon have primarily focused on the importance of waters north of the Faroe Islands, partially due to the long-line fishery operating there until 2001 [e.g. 33, 34]. Waters off the Faroe Islands are undoubtedly important feeding grounds for both European and North American Atlantic salmon during winter due to the aggregation of prey caused by the presence of the Iceland–Faroe Front [34, 35]. However, as waters surrounding Jan Mayen Island offer similar frontal and ecological conditions, it is possible that the utilization of these areas has previously been underestimated. This is particularly plausible for the northernmost Atlantic salmon populations, as a previous electronic tagging study on adults from the Alta River indicated utilization of these waters during winter . Furthermore, the positive correlation between latitudinal origin and northward displacement of Atlantic salmon within the Norwegian Sea during winter  emphasize the potential importance of waters surrounding Jan Mayen Island to a greater extent. 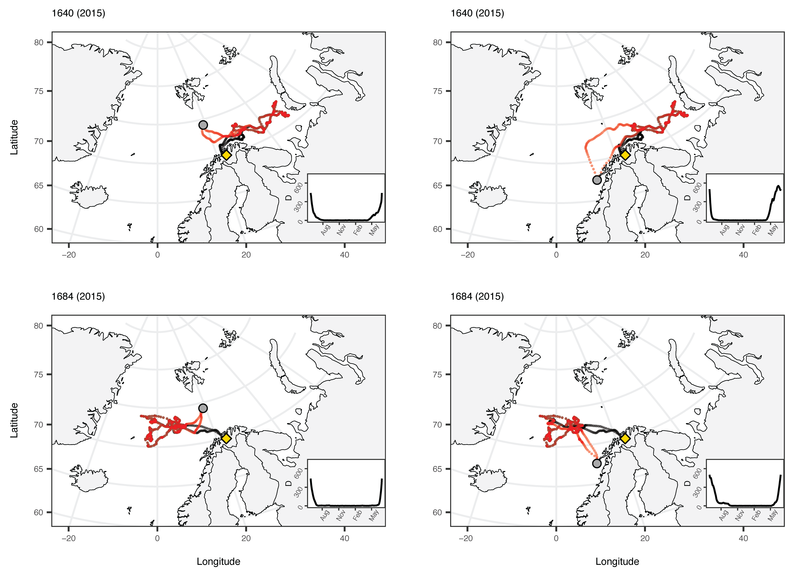 Previous records of Atlantic salmon in the Barents Sea are derived from end positions from fish tagged with PSATs and retrieval of tags from conventional tagging programs [9, 11, 36]. Consequently, the degree of individual residency within this region has remained unknown, making the current study the first to detect utilization of the Barents Sea throughout the ocean migration. To what extent Atlantic salmon utilize the Barents Sea is likely dependent on the geographical origin of the river. Pop-up positions for post-spawned Atlantic salmon from three Norwegian Rivers indicate that Atlantic salmon from the Alta River utilize these waters to a greater extent than individuals from a central, more southern Norwegian population, but to a lesser extent than Atlantic salmon originating from a river draining directly into the Barents Sea . For Atlantic salmon, it has been hypothesized that migrations follow the North Atlantic subpolar gyre . This hypothesis was developed with emphasis on maiden fish and explicitly postulates that North European Atlantic salmon moves northwards with the North Atlantic Current after ocean entry, before following the East Greenland Current southwards . In our study, the reconstructed tracks and residency distributions (RDs) provided inclusive support for the hypothesis, because only three fish depicted a partial counterclockwise migration with some overlap with the North Atlantic subpolar gyre. This, together with evidence from studies on North American Atlantic salmon, which revealed that individuals migrated independently of the gyre system [7, 8], suggests that horizontal movements of adults are primarily governed by other environmental factors. One possible explanation for this apparently varying importance of oceanic currents for the different life stages might be that the size of the adult Atlantic salmon enabled them to move directly towards the principal feeding areas they utilized during their first ocean migration. For Atlantic salmon, frequent diving behaviour during periods of daylight is considered associated with foraging [7, 10]. This behaviour was observed during large parts of the migration, with individuals diving frequently during the day and night in summer, and during daylight hours in autumn and spring. Similar seasonal changes in diving behaviour related to light have recently been observed for adult Atlantic salmon from several Norwegian populations, including the Alta River , suggesting that a reduction in diving activity during the darker parts of the year is common for the northernmost populations. In comparison, no consistent seasonal trends in diving intensity and diel vertical movements have been detected for adult Atlantic salmon from North America [7, 8]. Strøm et al. revealed that behaviour changed from being characterized by frequent dives during daylight hours to being more surface orientated with irregular deep dives when individuals shifted their horizontal distribution from the continental shelf to deeper waters. This suggested that vertical movement patterns in the studied North American population were primarily a function of oceanographic conditions . While it is likely that the temporal trends observed in the present study are to some extent governed by contrasting oceanic conditions, we argue that the consistent response displayed by individuals reflects that seasonal environmental variation is an important determinant for the diving frequency and diel vertical behaviour of Atlantic salmon in polar areas. In contrast to diving frequency and diel vertical movements, no consistent seasonal trend was found regarding the mean diving depth. This, together with the observed correlation between the mean monthly diving depth and depth of the mixed layer, are in accordance with a previous study of Atlantic salmon . In general, thermocline characteristics are known to shape the foraging behaviour of free-ranging pelagic teleosts, and for bluefin tuna, it has been proposed that individuals focus their diving around the thermocline, occasionally breaching the mixed layer, in order to facilitate prey encounters [18, 38]. To what extent this applies to Atlantic salmon is uncertain; however, it is likely that the depth of the mixed layer partially governs the observed depth use of Atlantic salmon due to food aggregations. The correlation between diving depth and depth of the mixed layer could further explain the weakened diel effect on vertical movements during the spring compared to the autumn, because the deeper vertical distribution of prey may force the Atlantic salmon to shift to a foraging behaviour independent of light availability. Overall, Atlantic salmon is known to display an opportunistic foraging behaviour during the ocean migration [39, 40]. Thus, the temporal changes in the diving behaviour of Atlantic salmon are likely indicating flexible foraging strategies, in which individuals change their behaviour in relation to both ecological factors and seasonal light conditions. Flexible feeding behaviours, inferred from vertical movements, have been recorded for various migratory pelagic species, and the ability to adapt to different abiotic and biotic factors is likely an important prerequisite for success for species that migrate across large geographical areas [5, 18]. Nevertheless, it is important to note that some of the observed variation in diving patterns could reflect alternative behaviours, or combination of several behavioural modes. Recent electronic tagging studies have revealed that post-spawned Atlantic salmon faces a predation risk during the ocean migration [7, 41], making it plausible that some of the vertical movements observed here may be specific behavioural responses to avoid predation. The low sample size in the current study was due to a combination of high failure rate and an overall low retrieval of the deployed tags. The low retrieval rate was unexpected, particularly as previous tagging experiments on post-spawned Atlantic salmon from the river indicated low post-tagging mortality and an ocean survival for females of minimum 32% . Few recaptures may relate to the exploitation rate of Atlantic salmon in the Alta River, which is low compared to many other Norwegian populations . Our results might be biased by the low sample size, particularly regarding the inconsistent correlation between the North Atlantic subpolar gyre and individual migration routes, meaning that adults’ overall dependency on gyre systems for transportation may differ from our observations at the population level. However, due to the consistent trends in vertical movements and the observed similarities in horizontal migrations between this and previous tagging studies [9, 11, 12], we argue that our general results are representative of the migratory behaviour displayed by post-spawned individuals from the study population. Hidden Markov models’ ability to reconstruct animal movements without light-based geolocations was of paramount importance for our study, which revealed that reliable descriptions of Atlantic salmon migrations can be reconstructed with limited raw latitude and longitude estimates. This supports Strøm et al. , who suggested that hidden Markov models are suitable for describing the horizontal migration of Atlantic salmon throughout its distribution range. The suitability was highlighted by the extensive overlap between original tracks and tracks without a fixed end point, the limited overall impact of changing start and end locations, and the negligible differences observed when altering temperatures. For tracks with omitted end points, deviations from the original tracks were only present during late spring and second summer for tags deployed in 2013 and 2014. This suggest a mismatch between the recorded temperatures and data from the Ostia database as the occurrence and magnitude of the differences coincided. During the spring and summer, likelihoods were largely driven by temperature due to the absence of longitude estimates, and the observed deviations could be caused by inaccuracy in the reference data, error in the tags’ temperature sensor, or a combination of both. Despite that few individuals were included in the study, the horizontal migrations indicated a strong fidelity to areas north of the Arctic Circle with profound individual variations in which specific ocean areas they use. This means that the ecological conditions over large ocean areas may affect the overall growth and survival for individuals of the same populations. Daily and seasonal variations in diving behaviour were similar among individuals and independent of their spatial distributions. This, in combination with the correlation between diving depth and depth of the mixed layer, suggested that the overall diving behaviour of Atlantic salmon is likely depending on both seasonal and oceanographic conditions. A correction to this article is available online at https://doi.org/10.1186/s40317-018-0148-0. AHR and EBT conceived and designed the study, AHR and JFS performed the experiment, JFS analysed the data, RDH contributed tools for the data analysis, JFS, EBT, RDH, and AHR wrote the paper. All authors read and approved the final manuscript. We thank the Alta Laksefiskeri Interessentskap and its members, for the necessary assistance in conducting the study. We also thank staff and students of the Freshwater ecology group at UiT The Arctic University of Norway for assistance during the fieldwork. The data and computational codes used in the current study are available from the corresponding author upon reasonable request. The study was approved by the Norwegian Animal Research Authority (NARA) in accordance with Norwegian laws for experiments using live animals. This study was part of the Salmotrack project (2008–2017), which was funded by the Tromsø Research Foundation (supported by Trond Mohn), the Norwegian Research Council (project 221400/E40), Alta Laksefiskeri Interessentskap, and the University of Tromsø. The publication charges for this article have been funded by the publication fund of UiT The Arctic University of Norway. 40317_2018_146_MOESM1_ESM.png Additional file 1: Figure S1. Latitude and longitude estimates for the two tags moored at a known location (69.890°N, 18.571°E), using the template fit (A and C) and threshold method (B and D). Horizontal red lines depict the true latitude and longitude. Solid vertical lines indicate the autumn and spring equinox, whereas stippled lines depict the winter and summer solstice. Blue points (D) indicate periods with satisfying longitude estimates used for uncertainty estimation. 40317_2018_146_MOESM2_ESM.pdf Additional file 2: Figure S2. Example of daily light curves from a tag attached to an Atlantic salmon (ID = 1257) for days with A) reasonable longitude estimate, B) inaccurate longitude estimate due to polar day, C) inaccurate longitude estimate due to insufficient light levels during polar night, and D) inaccurate longitude estimate due to erroneous sunrise and sunset estimates. Stippled grey vertical lines depict estimated sunrise and sunset, and solid blue lines depict estimated noon. 40317_2018_146_MOESM3_ESM.png Additional file 3: Figure S3. Daily likelihood fields for an Atlantic salmon (ID = 1574) during the ocean migration using: temperature; temperature and depth; and temperature, depth, and longitude. Colours indicate the data likelihood of the different grid cells, increasing from blue to red. 40317_2018_146_MOESM4_ESM.png Additional file 4: Figure S4. First summer (left panels) and second summer (right panels) residency distributions (RDs) for six tagged Atlantic salmon. Colours indicate probability of occupancy in each grid cell during the seasons. 40317_2018_146_MOESM5_ESM.png Additional file 5: Figure S5. Modelled mean tracks for six Atlantic salmon without fixed end locations (red points) overlaid the original tracks including known recapture locations (black points). Distances in km (D) between the original and altered reconstruction are depicted inside each panel (note the different scales on the y-axes). Yellow diamond depicts the Alta River and grey circles denote end positions for the altered reconstructions. Tag IDs are given above plot panels, with year of tagging in parentheses. 40317_2018_146_MOESM6_ESM.png Additional file 6: Figure S6. Examples of modelled mean tracks for two Atlantic salmon (ID = 1640 and 1684) with various start and end locations (red points) overlaid the original tracks. Distances in km (D) between original and altered tracks are depicted inside each panel. Yellow diamonds depict the Alta River and grey circles denote the altered start and end locations. 40317_2018_146_MOESM7_ESM.png Additional file 7: Figure S7. 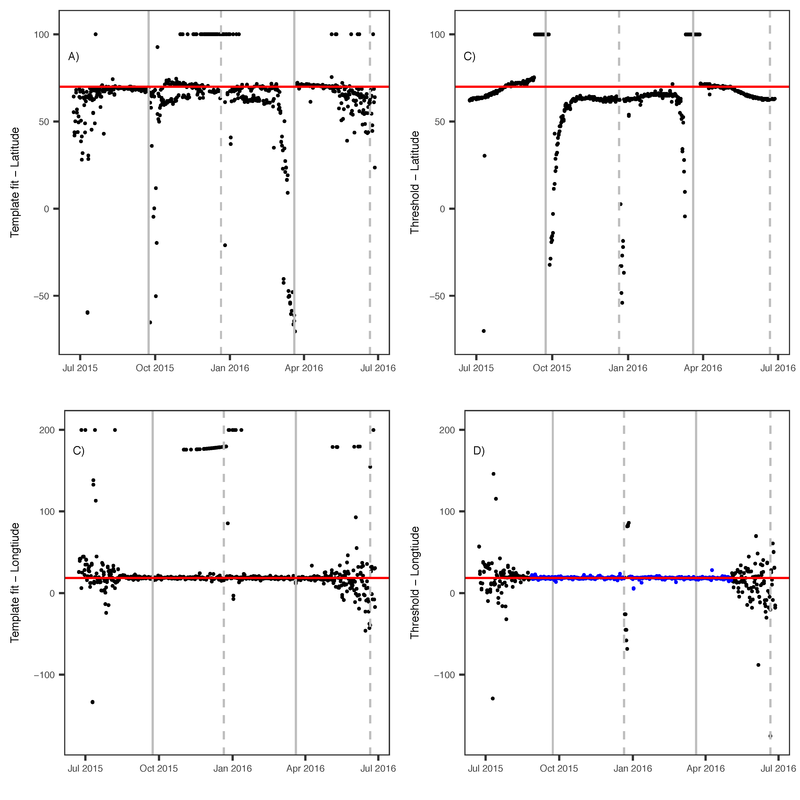 Modelled mean tracks for six Atlantic salmon with different temperatures. Black points depict the reconstructed track with original tag temperatures, blue points indicate a temperature decrease of 0.3 °C, and red points visualize a temperature increase of 0.3 °C. Differences in latitude (D) between the original and altered reconstruction are depicted inside each panel, with blue line denoting differences in latitudes caused by the temperature decrease and red line denoting changes due to increased temperature. Yellow diamonds denote the Alta River. Tag IDs are given above plot panels, with year of tagging in parentheses. UK Met Office. 2005. GHRSST level 4 OSTIA global foundation sea surface temperature analysis. Ver. 1.0. PO.DAAC, CA, USA. Dataset accessed 30 Apr 2015 at https://doi.org/10.5067/GHOST-4FK01. GEBCO General Batymetric Chart of the Oceans. Dataset accessed 8 July 2015 at https://www.gebco.net. Biavati G. RAtmosphere: standard atmospheric profiles. R package version 1.1. 2014. https://CRAN.R-project.org/package=RAtmosphere. TOPAZ4-ARC-MYOCEANV2_BE. Dataset accessed 16 May 2017 at http://marine.copernicus.eu.